“Where are you going?” our young neighbor Annika asked me as I walked alone down the block toward the playground. “To play ping pong,” I replied. She looked puzzled, so I swatted an imaginary ball with an invisible paddle, and she said “Ah! Tisch tennis! Oh, can we go too, Mummy?” she asked, looking up at her mother. Having just returned from an evening walk, her mother said, “No dear, we’re going in now,” and so my neighbors went in and I continued on to join my family at the communal ping pong table in the spielplatz at the end of our street. There are two tables and they are quite popular, but on this Friday night they were both open, and M and C were already playing. E put on the rollerblades I brought her from the flat, and she rolled around a bit before disappearing into the playground; I sat on the metal gate and waited my turn. Ping pong is a new activity for our family. We’d seen others playing it in the fall and wanted to try it, but you need your own equipment. I encouraged E to spend her Christmas money on a set, though I later had to buy them back from her—“No, you can’t play with them! They’re mine!” had fallen from her lips too many times. But over time it had become clear that they were mine and M’s. He might start out playing with C, but she’d soon tire of chasing after stray balls and turn the paddle over to me. And so it soon was, she offering me a turn. We’re well matched, M and I: equally mediocre. We don’t keep score. We try for long volleys, but can’t help trying to get in a sneaky shot past the other now and then. It’s my ping to his pong; my serve, his return; my ‘sorry,’ his comical run to chase the ball before it rolls into the gutter. Ping pong forces you to face one another, check if the other is ready, communicate a bit. Get active. Take chances. Be goofy. Run around. Remove a layer. Sometimes people walk by and unwittingly figure in our game—two little brothers in matching striped shirts walked up to the edge of our table and followed the ball for several minutes with their eyes until their mother emerged from the playground with a stroller and led them away. After they were gone M imitated their wide-eyed stares, a fair portrayal, though unkind. We resumed our play—my writing, his scores; my regattas, his performances; my S-Bahn, his U-Bahn; my kaffee pods, his filter kaffee; my dying laptop, his spry one. “Oh, like you aren’t,” he shot back, and I eyed him warily as I returned to the table. I smiled across the table to lower the stakes. Funny thing, the idea that we’re both playing to win yet not keeping score. Each of us keeping a mental tally instead, not of meaningless table tennis points but others, more dear—concerts attended, rows achieved; submissions pursued, publications accepted; respect earned, respect given. It’s always been like this, long before we found ping pong, but here’s a way to make it a game, reveal ourselves as the competitors we are; see if we can make fun of ourselves and remain civil. “You take yourself too seriously!” complains S to C sometimes, the beleaguered coming-of-age child singled out for her pride. The same might be said of M and me when ping pong is not a light game of table tennis but a table set for a marriage itself, pitting one’s passions against the other’s, weighing their relative merits; whose are paid for by an employer, whose are not. But there will be no day of reckoning, I presume. There’s just me and M playing ping pong at a neighborhood park in Berlin as best we can, our children skating circles around us, setting aside my blog, his book; my boathouse, his concert hall; my single, his Steinway—and letting the bouncing ball be the thing that knits us together, not drives us apart, as the warm spring evening descends to envelop us all. 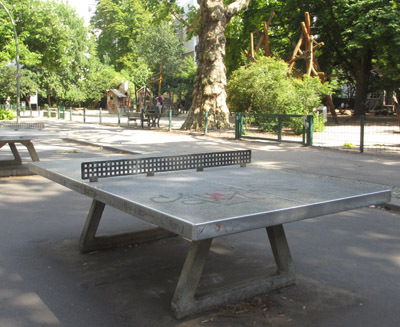 This entry was posted in City life, Sabbatical and tagged Berlin, ping pong, spielplatz, table tennis on June 9, 2014 by Jill M..
beautiful! And very poignant. Keep playing and seeing the beauty in it. Thanks, Hanna! I am grateful for your comment.